It was tempting to go another direction with this post: along the lines of “be careful what you wish for.” After desperately wishing for rain all summer, we ended up getting all of that missing rain yesterday: 9 inches in just one day. So much for the one day this year that I had agreed to open the garden for a tour. 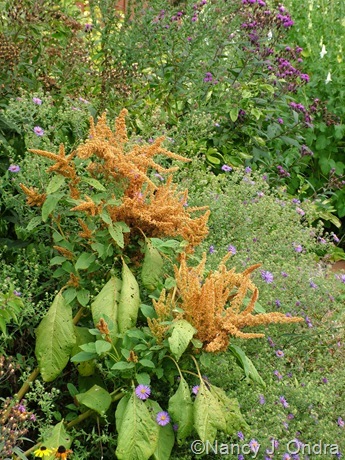 This morning’s reality included a toppled arbor, washed-out paths, and bedraggled asters. But really, fussing about too much rain isn’t any more helpful than all of the previous whining about too little, so I’d rather think about some new plants that have performed well this year, despite the adversity. Amaranths as a group thrive in my sun-drenched garden, so it’s fun to try a new one or two each year. Honestly, I have yet to find one that’s more stunning than ‘Hopi Red Dye’, because its foliage is as richly colored as its deep red plumes. ‘Autumn Touch’, though, turned out to be a pretty addition to the color options. 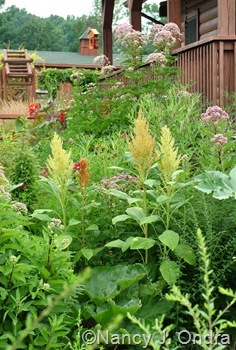 The foliage is an ordinary green, but the plumes come in a range of yellow-cream, toasty tans, and rich rusts. Even better was a group of orangey seedlings, which combined beautifully with yellows and purples (not so well with pinks, though). Catalogs give the height as anywhere from 3 to 5 feet; mine were all around 4 feet, so that’s fair. Don’t believe the “don’t need staking” line, however. My soil’s on the rich side, so I wasn’t surprised when the plants started to sprawl. I didn’t mind cutting down the paler ones, and their plumes made a lovely, long-lasting bouquet. I wanted to enjoy the rusty ones longer, though, so I cut off the top half of the plumes, and they responded as I’d hoped, with bushier growth and more, smaller plumes. That was enough to balance the heads, so they didn’t need staking, even though the stems were still leaning. I’ve gotten to enjoy them for another 6 weeks so far, and since they survived the storm, I imagine they’ll be around well into October. Amaranths seem to be sturdiest when they sprout directly in the garden, but as usual, I started these indoors in April to get a jump-start and transplanted them in the third week of May. 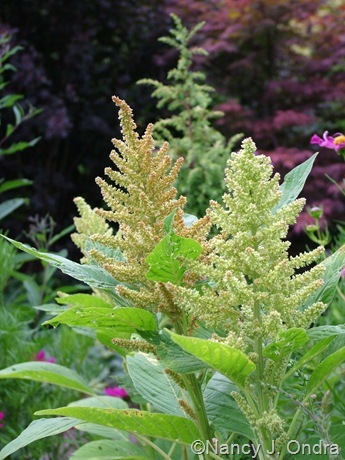 ‘Autumn Touch’ is available from Territorial Seed Company (as a cultivar of Amaranthus caudatus, which it definitely doesn’t resemble, being upright rather than cascading) and Park Seed (as ‘Autumn’s Touch’). Not surprisingly, another member of the amaranth family also did well in this year’s heat and drought: ‘Fireworks’ globe amaranth (Gomphrena). I started these indoors in mid-April (seed is available from Burpee) and set them out in late May. 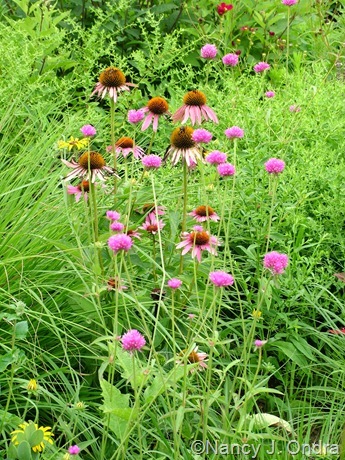 They were in bloom in early July, in time to complement pink phlox and purple coneflowers. The new blooms were a very vibrant purplish pink. The flowerheads are looser and not as rounded as the usual globe amaranths, and the stems are much taller: to about 40 inches. The stems are very slender and not very leafy, so they look best coming up through lower, bushier companions. I loved the effect of them paired with the abundant, slender foliage and soft spikes of ‘Cassian’ fountain grass (Pennisetum alopecuroides). The flowers of ‘Fireworks’ have aged to a softer rosy pink. I miss the brighter new color, but I appreciate how long they’re lasting, and how much they add to the rudbeckias, asters, and other autumn standards. And speaking of asters: I’ll finish this group with one aster that never needs staking and that will never keel over, no matter how much rain they get pelted with: ‘Snow Flurry’ heath aster (Symphiotrichum ericoides). Granted, the straight species is quite sturdy in its own right, with stiff, woody stems that reach 3 to 4 feet tall. 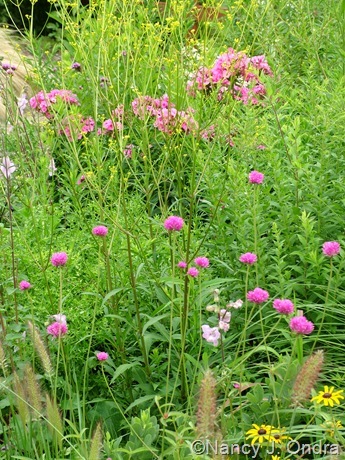 It thrives all through my meadow, with the grasses and red cedars, and it has seeded into the garden, where it creates a frothy, baby’s-breath-like effect in September and October. I normally wouldn’t be interested in a shorter form of something this fine, but ‘Snow Flurry’ isn’t just a more-compact form: it has a completely different, ground-hugging growth habit. 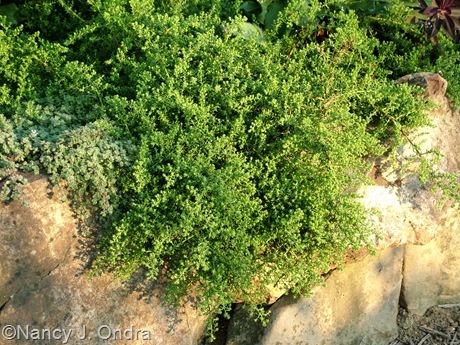 Through the summer, it was only quietly interesting, mingling comfortably with woolly thyme (Thymus pseudolanuginosus). 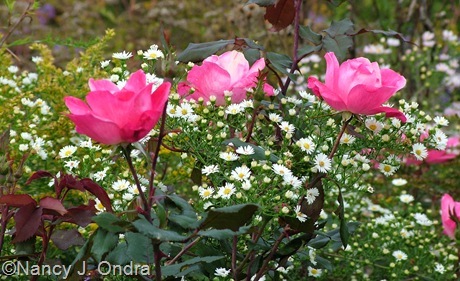 It really came into its own in early September, as the hundreds of dainty buds burst into bloom. What a pretty thing! 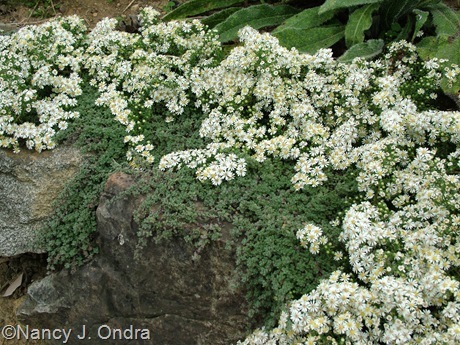 Like the species plants, ‘Snow Flurry’ thrives in full sun but adapts to light shade too. I’m looking forward to interplanting it with both spring and fall crocus to make even better use of the space it fills. There’s just one weird thing: my ‘Snow Flurry’, and those I’ve seen in other gardens around here, are all in the range of 3 to 4 inches tall, but several nurseries sell taller plants under the same name. (Lazy S’s Farm offers a 10- to 12-inch clone, for instance, and Sunlight Gardens describes theirs as being 12 to 18 inches tall.) 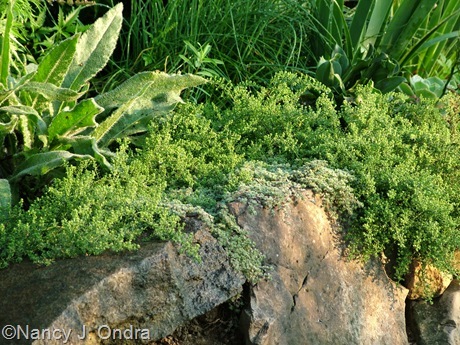 If you want to get the true mat-forming form, try High Country Gardens or Fairweather Gardens. I so adore your “Three Neat Plants” posts, Nan! 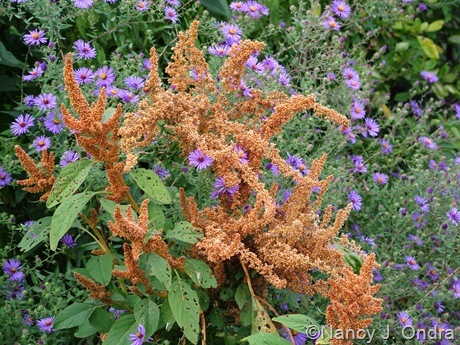 And that aster really surprises me with how pretty (quietly pretty, as you said) it looks when not in bloom. At first glance, it could have been some kind of low, sprawling juniper or similar textured evergreen. Very nice. 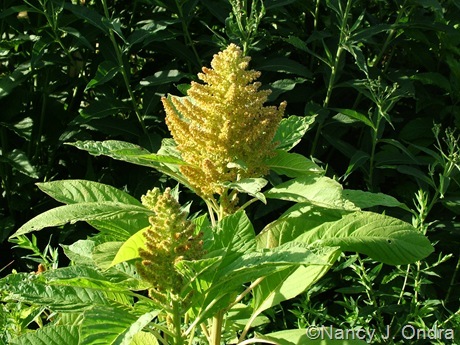 On the amaranth, what’s your secret to the long-lastingness (made up word!) of the bouquets? Mine always seem to get icky faster than I expect, although that might be mostly the leaves. They seem to droop and wilt in a day or two. Do you just cut the leaves off before you throw them in a vase? Not sure what to tell you about getting the amaranth to last in bouquets, Kim. I did remove the leaves (they usually get chewed up by various bugs, so they were damaged anyway), but I didn’t do anything special beyond that, and they lasted well over a week. Maybe it was because the heads were still flowering and not forming seeds yet? Three excellent neat plants to read about this morning. I am thinking of all kinds of places to put some heath aster. I’m enjoying the way ‘Snow Flurry’ creeps over a wall, but I’ve also seen it planted at the edge of a driveway and a brick walkway, and it looked great spreading over the hard surface. Another wonderful TNP post. I was going to pull my Hopi Reds this morning but noticed the recent 100+ heat brought on new leaf growth, so they stay a bit longer. Maybe there’s more life in them yet. I find that gomphrena intriguing too, and it’s also responded to the warmer weather. They remind me of late season drumstick alliums, bright pink instead of maroon. You grow these heat lovers so well! 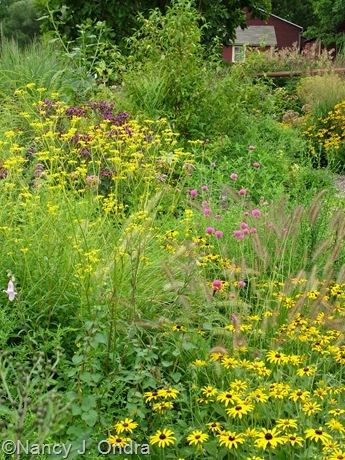 No, certainly no problem with heat-lovers here this year – as long as they were also drought-tolerant. You’re right about the ‘Fireworks’ globe amaranth looking something like drumstick alliums. I hadn’t thought of that! 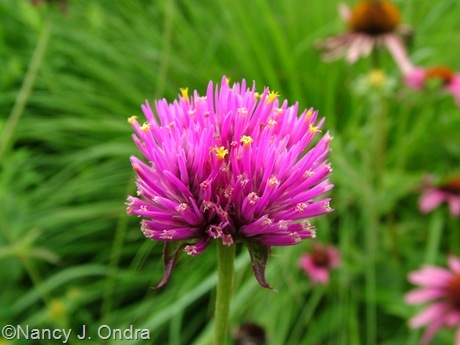 Color-wise, the allium wins, but the globe amaranth gets a gold star for its months-long bloom period. Interesting globe amaranths, love the color and they remind of verbena bonariensis. I love the verbena, but as you mentioned, it self-sows like crazy. I want something that self-sows just a little . . . Let us know if any come back next year. 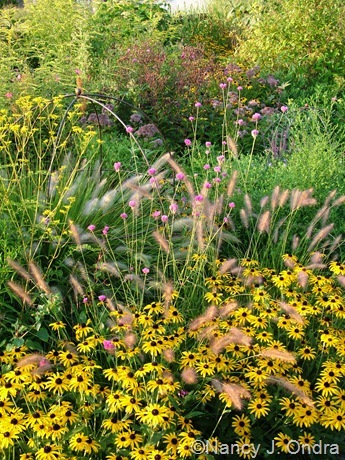 Great photo with the waving grasses and rudbeckia. 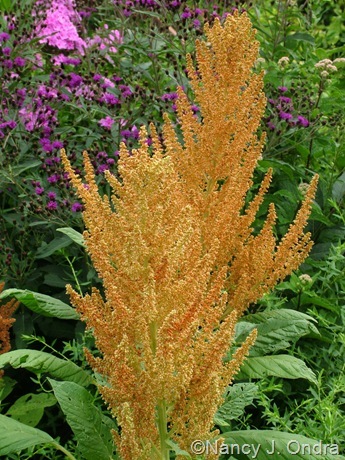 I have hopi red dye amaranthus and just love the rich saturated tones. They also self-seed aggressively though. Too right about the ‘Hopi Red Dye’, Brenda. I knew it was time to move from my old place when I spotted them popping up in cracks in the street almost a block away. I love that ground hugging aster. It is snow before the snow. What a lovely observation, Layanee. The plant was well named. 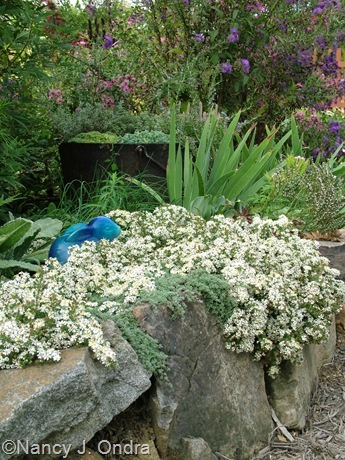 I really like how you have the aster cascading over the rocks! I’m a sucker for a big rock in the garden though. I haven’t done much with the amaranths even though I have seed for them. I bought Autumn torch a while back but never planted it! Sorry about all the rain – I would happily have taken 2-3 inches of that from you! We have more rain now, Dave – I’d be delighted to share it with you if I could. It really is neat to see how ‘Snow Flurry’ hugs the rock wall. That one bed was my attempt to get a raised area with better drainage for thymes and culinary sage. Success with the herbs has been mixed, but the aster is certainly happy there. Oooh, I loves asters. Must put ‘Snow Flurry’ on the list of wants. 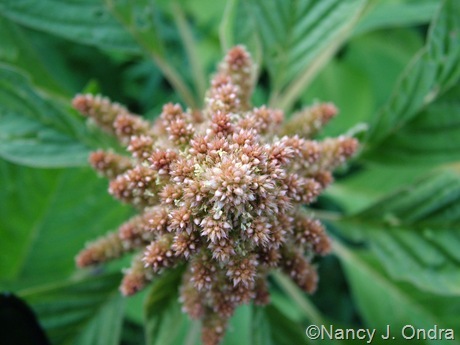 I’m writing about Rose Rosette today, and I’m linking to your post on GGW. Can I just say I hate RR? Lost three roses to it so far. Definitely, I believe they look great together: a super contrast of flower forms. And absolutely, you can vent all you like about rose rosette disease – it’s devastating. I think I have the taller form of ‘Snow Flurry.’ I need the shorter one to drape over the retaining wall. The taller one, just doesn’t look quite right. I wonder how there ended up being such a difference in the forms. Maybe someone propagated theirs from seed instead of vegetatively, or else took cuttings from a reverted shoot? Or perhaps another tissue-culture snafu? Hmmm. Hi Nan! I tried to send you an email last night but it was rejected. I must have an old address for you. Hi Amy! Try nan at hayefield dot com.